Our family welcomes you and yours to the Cabins on Strawberry Hill, our scenic mountain resort located on the edge of the village of Strawberry, Arizona. Snuggled in the Ponderosa Pines at a perfect elevation of 6,100 feet, this is the last privately owned land tucked beneath the majestic Mogollon Rim and bordering the 3 million acre Tonto National Forest. Our cabin rentals are also only a few hours away from Flagstaff, AZ. The resort offers fourteen knotty-pine, chalet-style (A-frame) rental cabins. All of our cabins are cozy, comfortable, very well equipped and, most importantly, exceptionally clean. A unique feature in our living room is the soaring rough-pine ceilings that are open two-stories above the living room, clear to the top of the cabin. These vaulted living room ceilings make our cabins feel relaxing and cozy inside, one of our most appreciated features. Living rooms provide a queen sofa-sleeper, a cushioned chair, and cable TV. Each cabin also has a free standing woodstove fireplace, which is the cabins primary source of heat. In addition, the cabins also have small electric space heaters. Please Note – We provide complimentary wood from mid-October through April (most cabin resorts do not offer this costly amenity). The kitchenettes have a 4-burner stovetop, microwave, coffee maker, toaster, refrigerator/freezer, dishes, pots/pans and utensils for cooking simple meals. Our kitchenettes do not have a regular convection oven, however, a 22 quart electric roaster oven is available upon request. Please keep in mind there is only a few and are provided on a first come first served basis.” The bedroom has a queen bed with a Serta “5-Star” or “Luxury Suite” mattress. Off of the bedroom is a full bathroom with a combination bathtub and shower. In our two bedroom cabins, our 2nd bedroom is an open sleeping loft with either a queen bed or two twin beds. In addition to each cabin’s private back patio with picnic-table, there are gas grills, charcoal grills and picnic tables located around the property for shared use among our guests. We keep our resort cabins clean and well maintained. 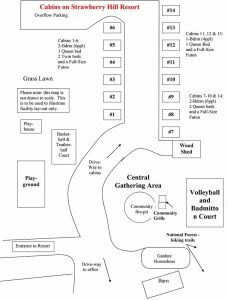 Outdoor resort activities include basketball, badminton, volleyball, tetherball, ping-pong, horse-shoes, a flagstone patio with campfire pit, swing-sets, sand-box, children’s playhouse, as well as hiking trails that lead directly into the national forest and much more. You may light the resort campfire at any time (weather conditions permitting). The resort provides complimentary wood for the camp fire pit. We also supply a Visitor’s Guide, hiking trail descriptions, fishing guide, coffee and coffee filters, creamer and sugar packets, salt, pepper, dish soap, matches, wood (Oct – April), bathroom tissue, Kleenex, hand soap, paper towels, kitchen & bath towels, and bed linens. Our resort is a 5-to-10 minute walk from several restaurants. Please visit our other pages here on our web site.